Originally published in England in 1848, this small book (5 inches high by 4 inches wide) 1848 is a very close reproduction of the original. 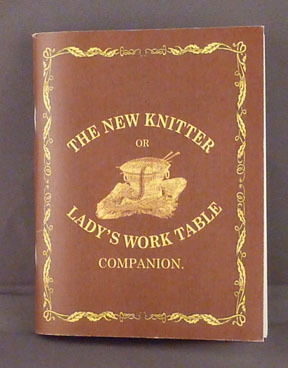 It contains a wide variety of knitting patterns although only three patterns are for entire garments. Those are patterns for a baby's turban hood, a knitted shoe, and cuffs or baby's socks. The rest of the patterns are for decorative items, such as trim, lace edging,d'Oyleys, and covers. There are some engravings showing the finished projects and some are absolutely gorgeous but, from a beginning knitter, don't look like I would tackle them. A much more experienced knitter like my wife would probably need to concentrate when starting to get the feel for the pattern. The main body of the book is reproduced to look just like the original. However, it has an added bonus at the back. The publisher included two pages of black and white photographs of samples that were found inserted into her original.